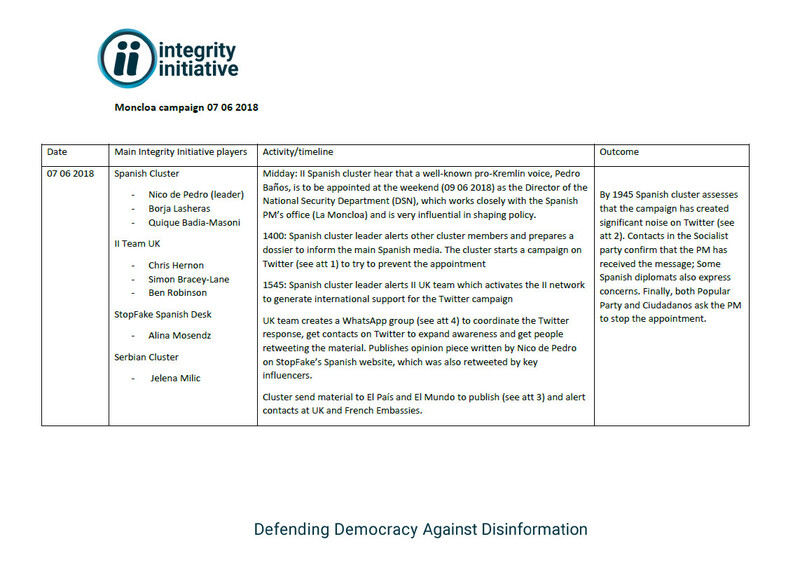 The ‘Integrity Initiative‘ builds ‘cluster’ or contact groups of trusted journalists, military personal, academics and lobbyists within foreign countries. These people get alerts via social media to take action when the British center perceives a need. The Initiative and its operations were unveiled when someone liberated some of its documents, including its budget applications to the British Foreign Office, and posted them under the ‘Anonymous’ label at cyberguerrilla.org. The Initiative has a black and white view that is based on a “we are the good ones” delusion. When “we” ‘educate’ foreign national audiences through a secretive government operations it is a legitimate operation. When others do similar, it its disinformation. That is of course not the reality. The Initiative’s existence itself, created to secretly manipulate the public, is proof that such a view is wrong. If its work were as legit as it wants to be seen, why would the Foreign Office run it from behind the curtain as an NGO? The Initiative is not the only such operation. It’s applications seek funding from a larger “Russian Language Strategic Communication Programme” run by the Foreign Office. What else is financed through that program’s budget? – HQ NATO, via the Policy Planning Unit into the Sec Gen’s office. A look at the ‘clusters’ set up in U.S. and UK shows some prominent names. 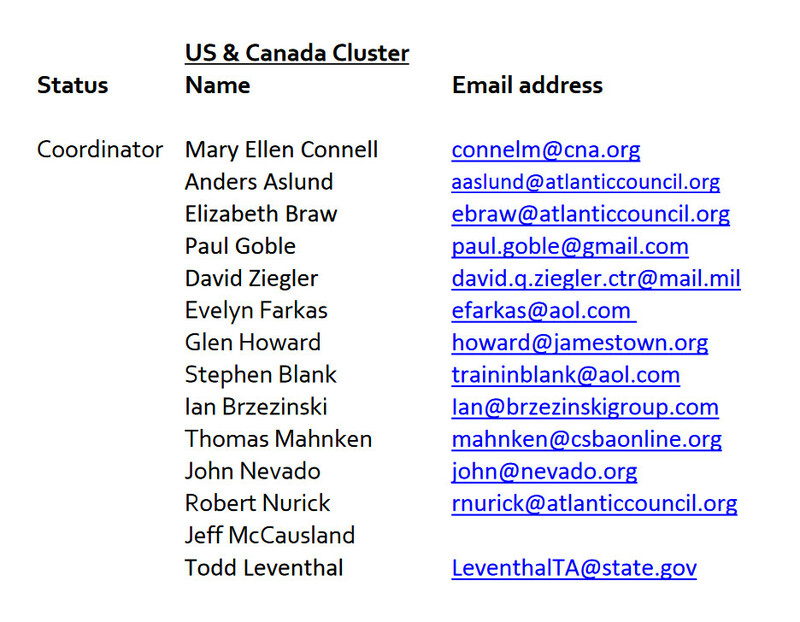 Members of the Atlantic Council, which has a contract to censor Facebook posts, appear on several cluster lists. 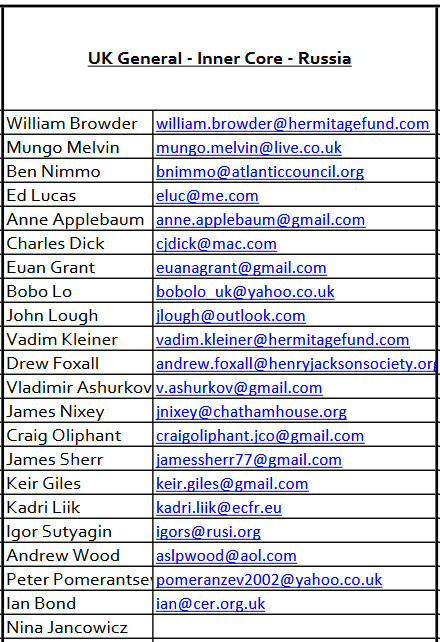 The UK core cluster also includes some prominent names like tax fraudster William Browder, the daft Atlantic Council shill Ben Nimmo and the neo-conservative Washington Post columnist Anne Applebaum. One person of interest is Andrew Wood who handed the Steele ‘dirty dossier’ to Senator John McCain to smear Donald Trump over alleged relations with Russia. 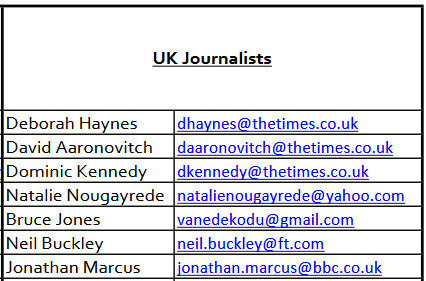 A separate subcluster of so-called journalists names Deborah Haynes, David Aaronovitch of the London Times, Neil Buckley from the FT and Jonathan Marcus of the BBC. A ‘Cluster Roundup‘ (pdf) from July 2018 details its activities in at least 35 countries. Another file reveals (pdf) the local partnering institutions and individuals involved in the programs. The Initiatives Guide to Countering Russian Information (pdf) is a rather funny read. It lists the downing of flight MH 17 by a Ukrainian BUK missile, the fake chemical incident in Khan Sheikhoun and the Skripal Affair as examples for “Russian disinformation”. But at least two of these events, Khan Sheikun via the UK run White Helmets and the Skripal affair, are evidently products of British intelligence disinformation operations. The programme is proposed to run until at least March 2019, to ensure that the clusters established in each country have sufficient time to take root, find funding, and demonstrate their effectiveness. FCO funding for Phase 2 will enable the activities to be expanded in scale, reach and scope. As clusters have established themselves, they have begun to access local sources of funding. But this is a slow process and harder in some countries than others. HQ NATO PDD [Public Diplomacy Division] has proved a reliable source of funding for national clusters. The ATA [Atlantic Treaty Association] promises to be the same, giving access to other pots of money within NATO and member nations. Funding from institutional and national governmental sources in the US has been delayed by internal disputes within the US government, but w.e.f. March 2018 that deadlock seems to have been resolved and funding should now flow.The programme has begun to create a critical mass of individuals from a cross society (think tanks, academia, politics, the media, government and the military) whose work is proving to be mutually reinforcing. Creating the network of networks has given each national group local coherence, credibility and reach, as well as good international access. Together, these conditions, plus the growing awareness within governments of the need for this work, should guarantee the continuity of the work under various auspices and in various forms.